After the pain they would bathe you. After the torture there was usually blood, or bruised skin and aching muscles. With some little kindness, sometimes they used epsom salts in the baths. You would sink into them, ignoring the dirt and grime, desperate in your need. Returning to the water as a child may yearn to return to the safety and security of the womb. For half an hour they would let you float, processing the ministrations of the day. Music would be piped into the room, sometimes soft, sometimes discordant, usually both. Sometimes you were alone and sometimes not, but you never shared your stories. You never spoke to others there. Some things are too terrible to speak of – putting words to them would make them more real, when all you needed to do in the brief bliss of the water was to forget. I hated and loved the baths then, just as I hate and love them now, in more ordinary household surroundings. All the pain of those times is imprinted on me, colouring even the most simple pleasures with a darker undertow. The undertow of the water, where often in those days I prayed for the bravery, the courage, to let the undertow drawn me down, that I might drown. But bravery eluded me then, as it does now. And that, of course, was part of their genius. Part of their plan. 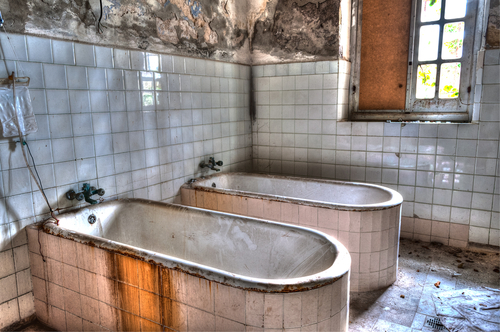 This entry was posted in Horror Flash Fiction and tagged baths, cruelty, darkness, fear, Horror, horror flash fiction, memories, torture. Bookmark the permalink. Bravery eluded me. Great line.